by Plato; Grube, G. M. A. 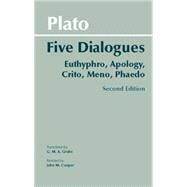 This second edition of 'Five Dialogues' presents Grube's distinguished translations, as revised by John Cooper for 'Plato: Complete Works'. A number of new or expanded footnotes are also included along with an updated bibliography.